Anne Kelley Russell offers her clients a wide range of estate planning and wealth transfer advice. Primarily, she provides counsel to individuals and families who want to ensure that their wishes are followed in the event of a serious illness or death. In doing so, Russell reviews and drafts simple and sophisticated wills, trusts, powers of attorney and living wills for her clients based on their needs. When applicable, Russell advises clients on estate and gift tax planning to accomplish the efficient transfer of wealth to the next generation. Russell petitions the probate court on behalf of clients who seek the positions of court-appointed guardian and conservator for their incapacitated loved ones, and continues to counsel those individuals after receiving their court appointments. She also represents clients who serve as agent under a power of attorney. Russell has significant experience advising fiduciaries of estates and trusts on the probate and distribution of assets, the preparation and filing of fiduciary income and estate tax returns, and general estate and trust administration. 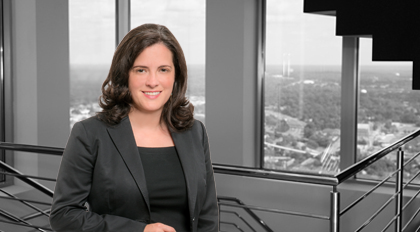 She also represents beneficiaries and fiduciaries in will contests, spousal elective share petitions, breach of fiduciary duty claims, and trust modifications. Panel Participant, 2014 ABA Joint Fall CLE Meeting — "Pre-Death and Post-Death Estate Planning for Closely Held Businesses"
Presentation, February, 2014, to South Carolina Association of Probate Judges, "Estate Tax Update"